Home / Resources / Safes / Most Secure Safes and Vaults in the U.S.
it’s one heck of a vault. Aside from a granite perimeter and armed guards, a crook would have to get past a 22-ton vault door, held by a lock that’s so advanced that it takes 10 people to access it. Fort Knox has never had a recorded robbery attempt. We’re willing to be no one’s quite ready to step up the plate on this one anytime soon. New York Federal Reserve Vault: Known as “the world’s biggest gold depository,” the NY Federal Reserve Vault is located under Manhattan. You actually aren’t even allowed to enter the vault – instead, pallets are moved robotically. Armed guards also keep watch over the perimeter, and it’s said that they’re more skilled than marksmen in terms of shooting scores. J.P. Morgan Chase Vault: Located in New York, this vault also holds gold. It’s known for having one of the most advanced vaults on Earth, next to impossible to access. The vault is also said to be able to withstand a nuclear blast. Federal Reserve Bank Vault of Cleveland: This vault in Cleveland, Ohio is best known for having the largest vault door on Earth. Specifically, it weighs a whopping 91 tons. Best of luck to any thief who attempts to access that. Broker Restaurant Antique Bank Vault: Located in Denver, Colorado, the building that now hosts the Broker Restaurant used to host the Denver National Bank. And while these days, the facility is known for serving high-quality dishes to hungry guests, the antique bank vault remains intact. The Mormon Vault: Built into the rock in Little Cottonwood Canyon, Utah, this vault is owned and maintained by the Church of Jesus Christ of Latter Day Saints. Specifically, it’s located 600 feet deep into the rock and designed to withstand a nuclear blast. While there are administration offices also located near the vault, it’s not open to the public. Nobody really knows what the Church is storing away inside the vault, and conspirators have hypothesized everything from historical documents to genealogy records. And with the vault so secure, we’ll likely never know. and there’s even a backup generator in the event of a power outage. It’s said that only two people have access to the vault (and nobody knows who they even are). Is it a bit silly to invest so much into protecting a fast food recipe? Perhaps. But the KFC vault remains one of the most secure vaults in the United States. Church of Scientology Vault: The Church of Jesus Christ of Latter Day Saints isn’t the only religious organization with a top secret vault. And, perhaps fittingly, the Church of Scientology’s vault is located underneath the New Mexico desert, close to Area 51. Housed in a cave and designed to withstand the impact from an atomic bomb, it’s also shielded by 5,000-pound steel doors, gates and security cameras. However, from a birds-eye view, you can see where it’s located based on crop circle-like formations that are carved into the ground over where it rests. We’re betting that not even Tom Cruise is allowed access to the vault, whatever it is that it may hold. records vault on Earth. 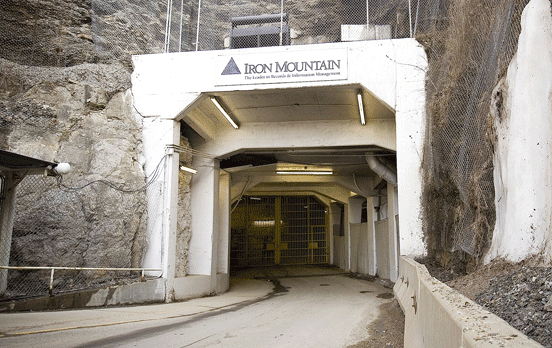 The bunker where the vault is housed is seven layers deep, buried a quarter mile into the mountain and protected by a security guard and 28-ton door. In order to get past the gate to the vault, you must have two forms of identification and special clearance. It’s reported that Bill Gates is among those who are storing items in the vault. Does your home or business have a safe on its premises? If it does, we’re betting that it’s not quite as secure as any of the ones that are mentioned on this list. But if it needs servicing or repair, it’s always best to contact the professionals. That’s where a commercial locksmith from Great Valley Lockshop enters the picture. Equipped to handle residential or commercial safes or vaults, Great Valley Lockshop is your one-stop shop for all lock needs. Contact us today at (610) 644-5334 or fill out our free online estimate request.